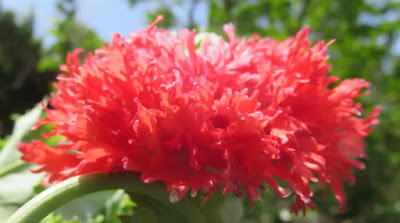 Does this poppy flower remind you of anything? It does me: I can't look at it and not be reminded of Vermeer's painting Girl with a Red Hat. Here's a link to the Vermeer painting - see for yourself! Poppies like this were well known in Vermeer's seventeenth century Delft. This poppy is one of the ones often sold under the bogus names Papaver laciniatum and Papaver paeoniflorum; in fact, it's one of the many cultivated garden forms of the opium poppy. Unlike the more familiar corn poppies, forms of Papaver rhoeas, these garden opium poppies produce comparatively huge flowers - the name paeoniflorum, which means peony flowered, is no exaggeration. On the other hand, unlike the corn poppies, they have a very brief season of bloom, and the individual flowers are not likely to last more than a couple of days in our climate.